As wireless technology advances, we are faced with more and more options regarding wireless routers. There are quite a few things you need to take into account when choosing the best wireless routers, all based on your specific needs, the kind of coverage you’re seeking and the speeds you need on a daily basis for web browsing purposes. What is a Wireless router and How Does it Work? A wireless router is a device which not only acts as a router for devices in a specific network, allowing them to communicate with each other and share information back and forth, but it also allows devices connected to it to access the internet through radio signals. There are several kinds of wireless routers, and it’s sometimes hard to figure out the differences between them. 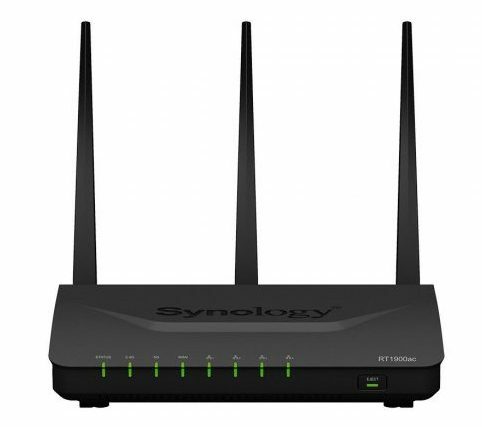 The main points you need to consider is their signal power, which can help cover larger areas with a stable wireless internet connection, and the encryption options the router offers. The latter is especially crucial in ensuring a safe, secure browsing experience and encrypted communications between devices in the router’s network. And last, but not least, you also have to take price into consideration: while companies or even small to medium businesses will need more stable connections across larger office spaces, home users might not be interested as much in those kinds of capabilities. The way it works is pretty complex, but not that hard to understand. Your internet provider will usually come over and install a cable to your home which carries with it the possibility of you connecting to the World Wide Web, which is a huge web of computers, all connected to each other to store, share and transfer information between them. The wireless router contains a modem, which takes in the cable from your internet service provider. It then transforms the information from that cable, which is in the form of an electrical signal, into a radio signal. This transfer of information through radio waves goes both ways – your device’s network adapter can also transfer back information to the router as radio waves, and the router then decodes it and again turns it back into an electrical signal which is then sent to your internet service provider through their cable. The network adapter in your PC, laptop, smartphone or tablet can recognize and read that radio signal, turning it back into readable information, thus giving you access to the internet, much like a car radio picks up radio waves and turns them into an audio signal. When you’re looking for the best wireless routers in 2019, you need to consider a few aspects which may impact your experience using the device and what it can do for you. To that end, speed grade standards – an 802.11, N, 300 and dual-band or even tri-band – are the first thing to look out for. As their name suggests, they offer various speeds for transferring data wirelessly, but you also need connected devices which support them, even though there’s backward compatibility available for all models. Dual band and tri-band are supposed to be the fastest, and the frequency of 5 GHz is the best regarding speed, at the cost of a lower overall range. The second thing to look for is third-party firmware compatibility: the ability to use firmware not created necessarily by the router’s manufacturer that can improve the router’s overall capabilities. QOS (quality of service systems) can allow for certain devices or tasks to be prioritized, so it’s another thing to consider if you have multiple devices connected to the same router and want to prioritize some to get more speed over others, or certain tasks to get higher priority in terms of data transfer rates. USB ports for connecting a hard drive can also come in handy, allowing you to store data retrieved by the router directly on the connected hard drive. And last but not least, wireless router reviews should go a long way in helping you find the best router if you’re not familiar with all the tech jargon surrounding them. There are other aspects as well, and we’ll explore some of them in the following list and find out which is the best wireless router in 2019. 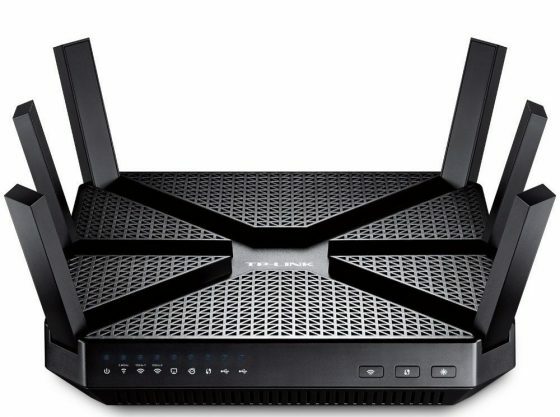 The Asus RT-AC88U is a great mid-level router, both regarding performance and regarding price. 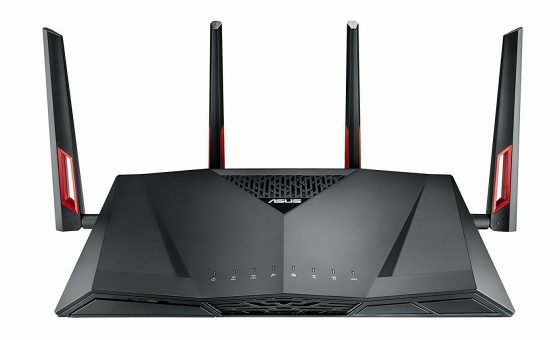 Asus is a pretty good brand overall, and users agree for the most part that they come up with great products – but will this router live up to expectations? Punching in dual-band capability for both 2.4GHz and 5GHz, with speeds up to 1000 Mbps and 2100 Mbps respectively, the RT-AC88U is capable regarding speeds and bandwidth range. The manufacturer underlines a 5000sqft coverage area for the router, and most users agree that the router manages to do so. The router also packs in 8 LAN ports, allowing for up to 8 different Ethernet-compatible devices to connect at the same time with no impact on the router’s capabilities. 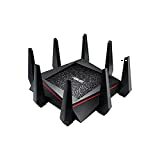 Gamers also have a good reason to take this router into account as a viable option, as it offers built-in game acceleration, making use of WTFast technology for lower ping times. Easy to manage through the ASUSWRT User Interface and the Asus Router App for your smartphone. Some users got refurbished, used or malfunctioning devices, but were returned and replaced immediately with no problems. 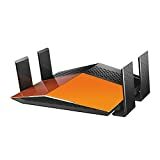 The TP-Link AC3200 Wireless Wi-Fi Tri-Band Gigabit Router boasts three separate Wi-Fi bands which allow for more devices connected to the router with no impact on speeds or signal integrity. 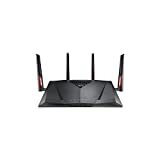 It comes at a rather low price for a mid-level router, but only if you don’t order it in a bundle with a hard drive, range extender or Riot Points bundle (for the popular MOBA game League of Legends). By all accounts, this is a router dedicated to video streamers and gamers especially. It features a 3200Mbps capability, perfect for low pings in-game and seamless video streaming. It has a dual-core CPU clocked at 1GHz for fast data transfers and another three smaller processors to boost simultaneous connections. 24/7 support and 2-year warranty. Some users complain of lower speeds than those advertised. If you’re looking for the more potent mid-level routers, the ASUS RT-AC5300 Wireless AC5300 Tri-Band Gigabit Router is the device for you. Featuring two bands of 2.4GHz and 5GHz respectively, and switching devices from one to the other to maximize signal strength and speed, this router is aimed at consumers who need something potent that can cover a rather wide area. It advertises up to 5,000sqft coverage at a speed of 5334 MBs. 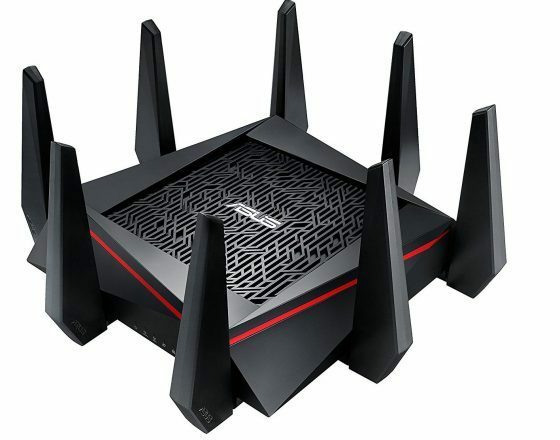 The built-in 1.4 GHz dual-core processor and 512 MB of memory of the Asus wireless router offer great processing power for the router, while the WTFast client offers gamers decreased latency and pings for seamless gaming through wireless connections. It also features eight antennae, 4 to receive, 4 to transmit and that’s what is supposed to increase its overall wireless coverage. The ASUSWRT user interface and the ASUS Router App make it very easy to set up connections and manage them, even through your smartphone. This is a device you should keep an eye out if you want better speeds over a wider area. 2 USB ports, one 3.0 and 2.0 respectively which offer great speeds for connected hard drives. The range advertised may be exaggerated a bit. 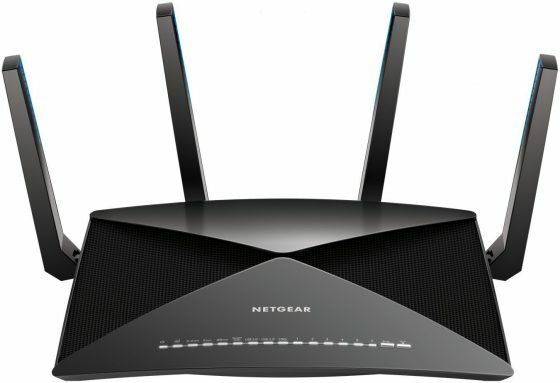 The Netgear Nighthawk X10 R9000 AD7200 is the first pro-level router in this list and the most expensive one so far. But is it worth its price? Let’s explore the Netgear wireless router. It features 802.11ac Quad Stream Wave2 WiFi along with 802.11ad WiFi that packs in 4600+1733+800 Mbps speeds wirelessly. However, what sets it apart is the 1.7GHz quad-core processor. This is amazing for gamers, streamers and even VR capability, so if you’re looking for a router which can handle huge amounts of processing on its own, this is worth a look. The Plex Media Server offers a great way to have external storage devices connected to the router and serve your network information from it. The antennas are high-performance ones who ensure higher speeds over wider areas. 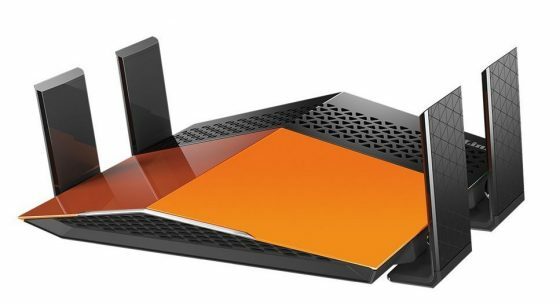 The Netgear Nighthawk X10 is also perfect for offices or small businesses, as it offers up to 10 Gigabit LAN ports. Up to 6 months, free unlimited storage on Amazon Drive included for general storage and backup. High price considering the lack or shortcomings of features expressed above. 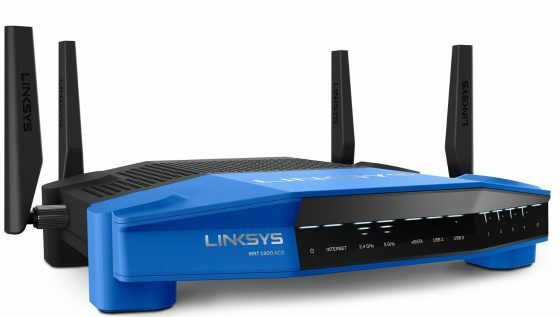 The Linksys WRT1900ACS sits pretty well on the top part of the lower-end devices, featuring a dual-core 1.6GHz processor and 512MB of RAM for greater data transfer speeds for both USB-connected devices and the overall wireless and wired connections it handles. The four external, dual – band detachable antennas offer quite a good coverage with decent speeds for the price up to 600 Mbps (2.4 GHz) and 1300 Mbps (5 GHz) for media. Open Source Ready tech and the Quick Start Guide offer a quick, easy and direct way for users to customize their experience with the router. Network Map is a visualization of the network map for easier management. The USB 3.0 and 2.0 ports allow for connected storage devices to the router to transfer data to the network. The built-in technologies for accessibility and its open-source approach allow for great customization and third-party firmware to be installed for greater functionality. Lacking serious customer support at times. 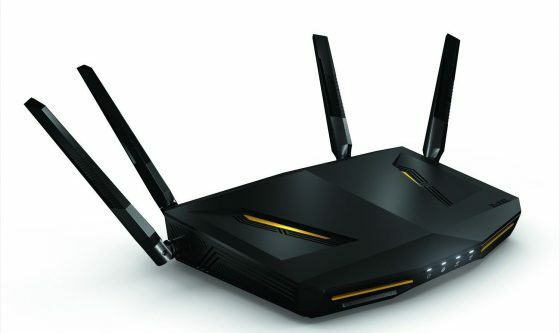 Still, on the low-end performance spectrum, the D-Link EXO AC1750 WiFi Router DIR-869, is a great starter router for home users and a few connected devices simultaneously. It offers 4 LAN ports for wired connections and a high-power amplifier, coupled with smart beamforming technology for higher wireless speeds with lower risks of packet loss. The dual core processor and the Smart Connect technology built-in offer greater speeds for gamers and streamers, while the QoS prioritizes applications and processes which require a higher bandwidth and adapts the router accordingly. The 5GHz and 2.4GHz networks of the D-Link wireless router offer diversity regarding bandwidth and the router switches devices between them depending on the specific speed needs of the devices. Easy to update firmware and most recent updates are stable. Fewer options than regular for encryption choices. A home router, the Synology Router RT1900ac is pretty expensive for lower end devices, but what does it offer? Can its built-in features and readily available technologies motivate its rather high price range? With a dual-core 1GHz processor and a total of 256MB of DDR3 RAM, this router is ideal for a home network. It even features WSA which allows for instant, easy to manage and setup secure wireless connection. The USB 3.0 port allows for a connected mass storage device or even external hard drive so you can either share data with the network or download directly to it precede the need to transfer huge amounts of information wirelessly, thus saving you a lot of time. A great feature this router has which you don’t see very often is an SD card reader incorporated into it. It also packs in 4 LAN ports for wired connections in your home. WPS-ready, power reset button, USB/SD eject capability; and Wi-Fi button for On/Off options. Still on the lower end, low-priced but decent regarding performance, the TP-Link Archer C9 Wireless router is a great choice for home users or non-demanding settings. It has 802.11ac support, and dual-band networks – 2.4GHz (up to 600Mbps) and 5GHz (up to 1300Mbps). The high-performance antennas are detachable and offer a pretty decent coverage, although there’s no area covered guarantee. It also has a 1GHz processor incorporated to deal with faster data transfers and processing power and allowing for watching 4k videos and pretty decent gaming experiences. If you encounter problems with connectivity, setup or configuration, you can access the 24/7 TP-Link customer support service. Regarding ports, you’ll find two USB ports, one 2.0 and another 3.0 respectively. A total of 4 LAN ports is included, as is the standard with most home routers. Beamforming technology and adaptable built-in QoS offer more viable connections for multiple devices. The product comes with a 2-year warranty. Good Wi-Fi coverage for the price range. Wi-Fi connections drop for quite a few users, though replacing the products usually solves the problem until the warranty is voided. At the forefront of mid-performance routers, the Zyxel Armor Z2 AC2600 is decently priced and pretty capable for said price range. The 2nd generation AC2600 chipset allows for up to 2600 Mbps speed through the 802.11ac support it offers. With 4×4 MU-MIMO technology incorporated, it allows multiple devices to be connected to it without getting in the way of its top guaranteed speeds. It also includes a stream boost option which is great for gamers who want to stream or people who watch streams in high quality, limiting packet loss and offering a seamless connection. Setup is fairly easy and straightforward with the Easy 123 technology, which also offers user monitoring of the connections and general router settings. Beamforming technology is used to enhance the overall power of the router and covers a wider area. Beamforming technology offers an increase of covered area. Not that many reviews available to ascertain whether or not this router is worth its price. 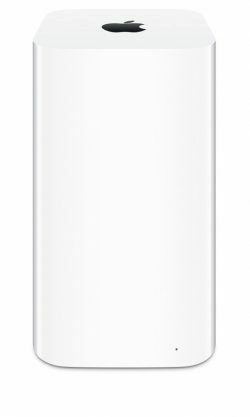 The last device on our wireless router reviews list is the Apple AirPort Extreme. And as you may expect, the first thing you notice about this product is its flawless, simplistic, minimalist design which looks amazing. 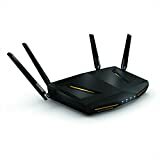 It uses the 802.11ac Wi-Fi technology for fast connection speeds, and it is backward compatible with 802.11a, 802.11b, 802.11g, 802.11n, and 802.11ac devices. 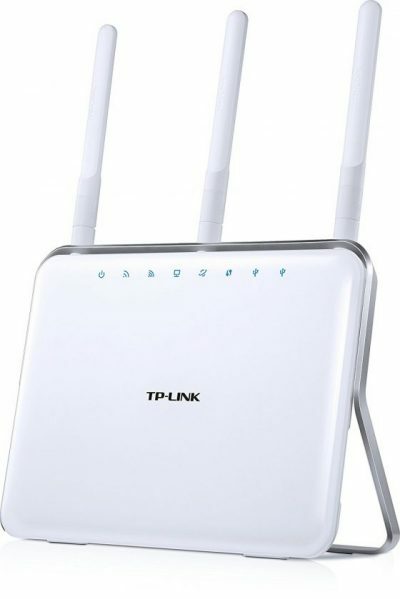 It packs in a total of 6 antennae at the top for the wider coverage area and offers a dual-band 802.11ac Wi-Fi support for simultaneous connections at 2.4GHz and 5GHz respectively. The bandwidth is clocked at 80MHz-wide channels. With a height of 6.6 inches and a 3.85-inch base, it can be placed just about anywhere, and it just looks amazing. It is also pretty decently priced for an Apple product, even though it is only a Wi-Fi router and will require a separate modem to operate. However, it does feature seamless and easy to set up connections with Macs and iOS devices. It also comes with an integrated USB 2.0 port. Includes 3 LAN ports and a USB 2.0 port. Lower speeds than advertised in some cases. So, there you have it. A total of 10 great contenders for the best wireless router in 2019. Depending on your specific needs, you’re bound to find the perfect match within this list – read through the pros and cons and make an informed decision. Remember that your router will be responsible for stable connections across all your internet-dependent devices, so keep speeds in mind, along with general stability when ordering your wireless router. Some offer better stability through lower packet loss technologies incorporated – so refer to the above list whenever you’re in need of a few tips and pointers on which device will best suit you.